This gallery contains images made in response to details of the life cycle of trees and plants in hedgerows and woodland in Northumberland. Line, shape, form, pattern, texture and colour were of particular interest. 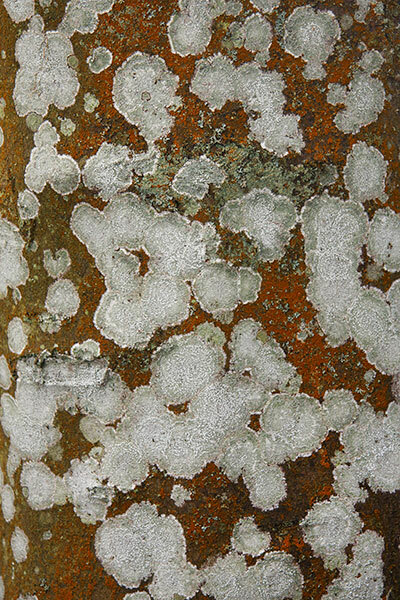 I liked the dusting of lichen on this tree bark. 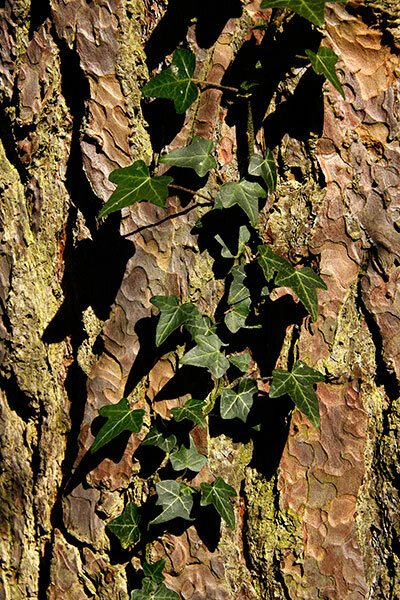 Given time, this tree could be tightly bound in increasingly heavy ivy growth from the ground to it's high branches. 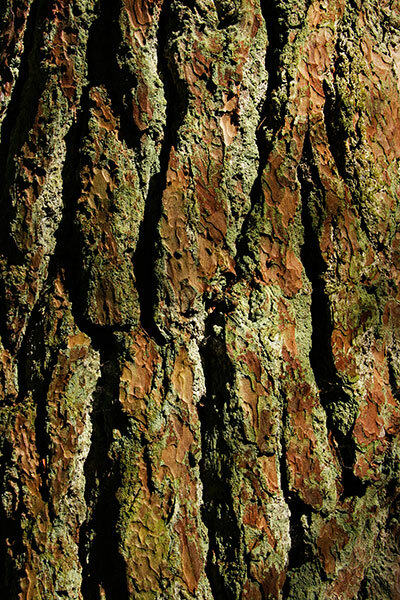 The soft red of the smooth bark surface and the finely textured and overlapping medallions of lichen appealed. 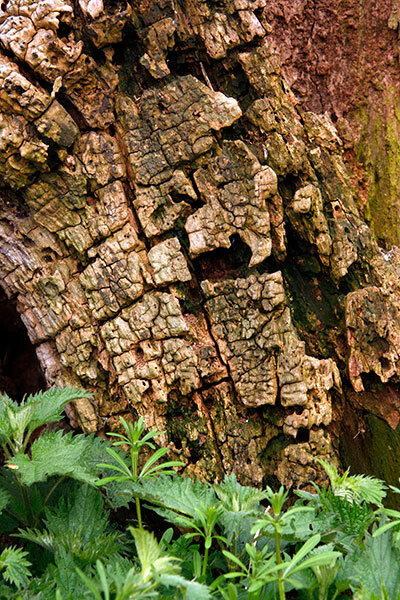 A standing trunk with lower branches intact was riddled with the tunnels of wood boring beetles. The thick grey bark was cracking like freeform paving before breaking away to reveal the timber itself. Green algae flourished in the dampness around the deep fissures in the tree bole. 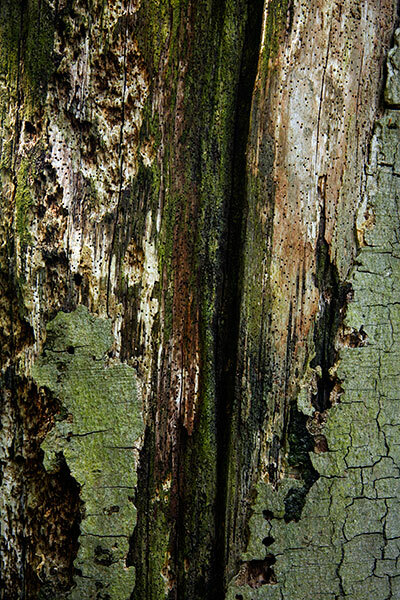 The bark had largely disappeared from this dead tree. 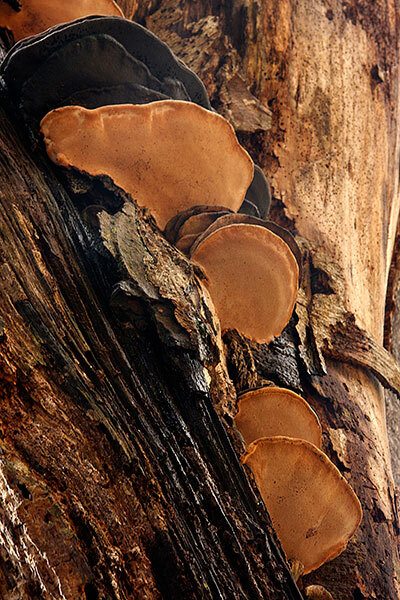 The plates of the bracket fungus were growing in an arc in the junction of the trunk and a major branch. More than one size of wood boring insect seems resident here. 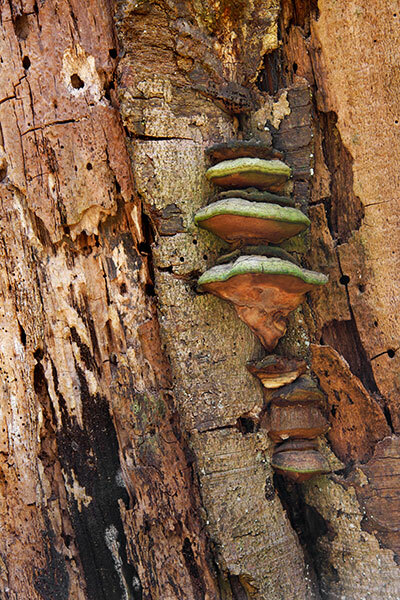 I liked the contrast between the copper verdigris topping on the fungus against the brown tonal range of the wood. 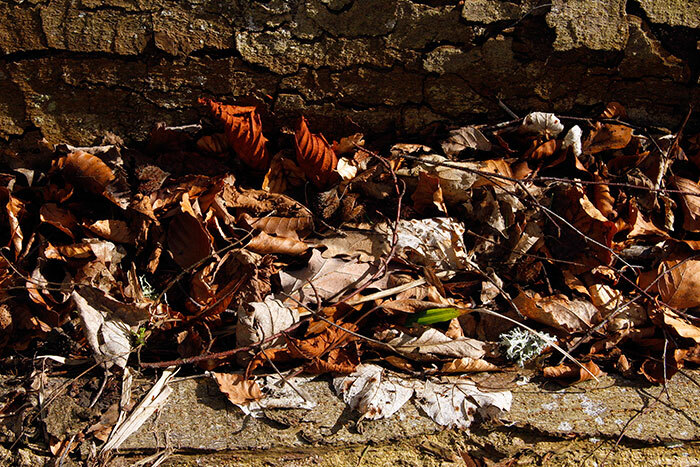 Dried leaves from the previous autumn collected in a trough in the trunk of a fallen tree are lit by bright spring sunshine. A once substantial tree grew amongst others on one bank of a brook running close to a minor country road. 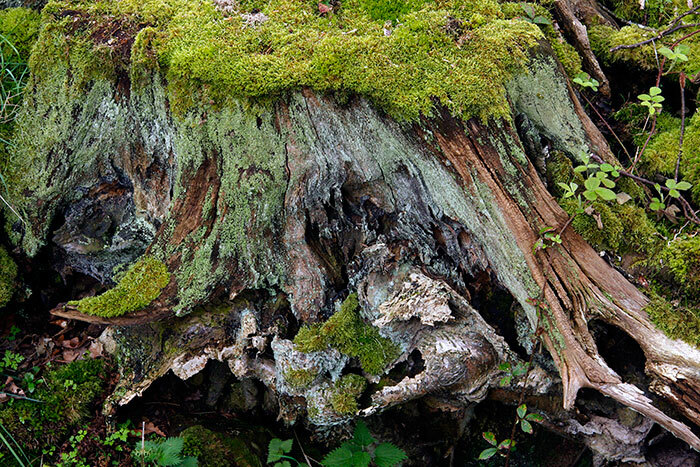 Cut down some time ago, the stump's flat top is home to a spread of brilliant green moss encouraged by the sheltered and moist conditions. 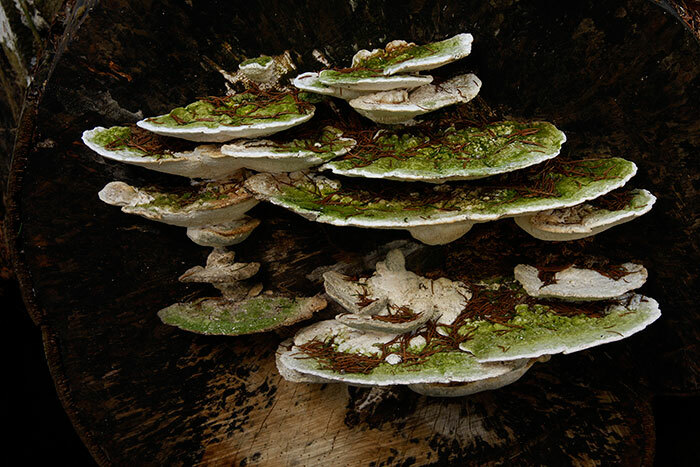 The roots have been undercut by the stream and the greys of the decaying wood are accented by darker lichen growth. 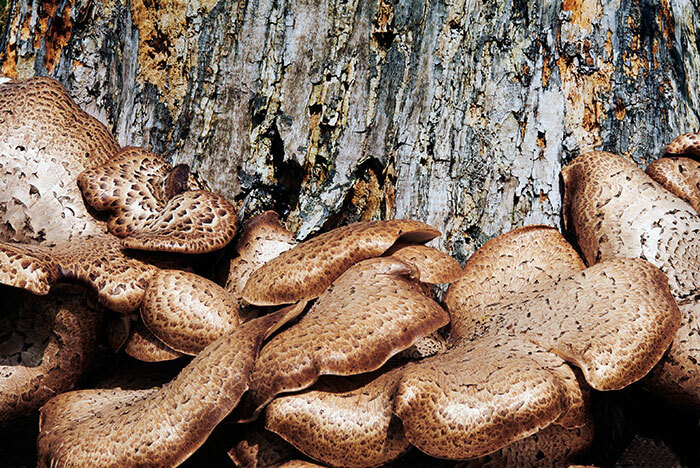 I don't' recall ever seeing such an exuberantly fresh growth of bracket fungus as this one. Growing just above the grass, its arc enclosed almost half of the trunk's circumference and caught the best light of the day. The tree was set on a ridge that might once have carried a fence or hedge above the level of track and field. In form these were like a bizarre white and green glazed ceramic bracket cake stand carrying strangely coalesced edibles dusted with pine needles. 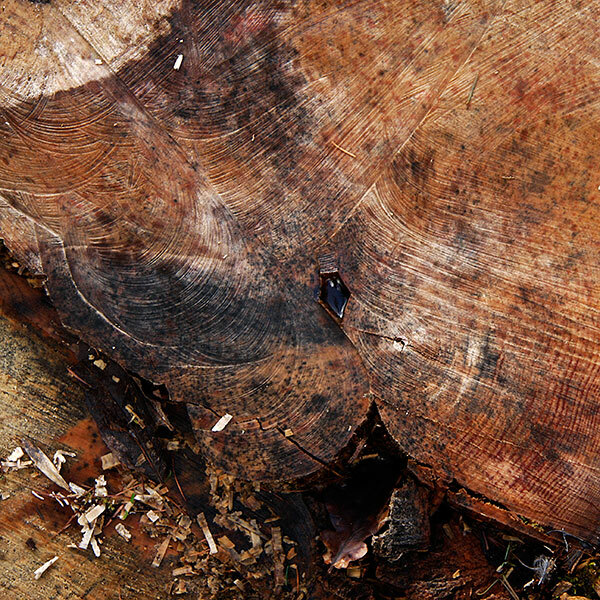 The contrast between the lines of the regular growth rings and those in the freeform arcs cut by the chainsaw teeth appealed. The whole images reminded me of aerial photographs of agricultural land being worked by plough, harrow and seed drill. 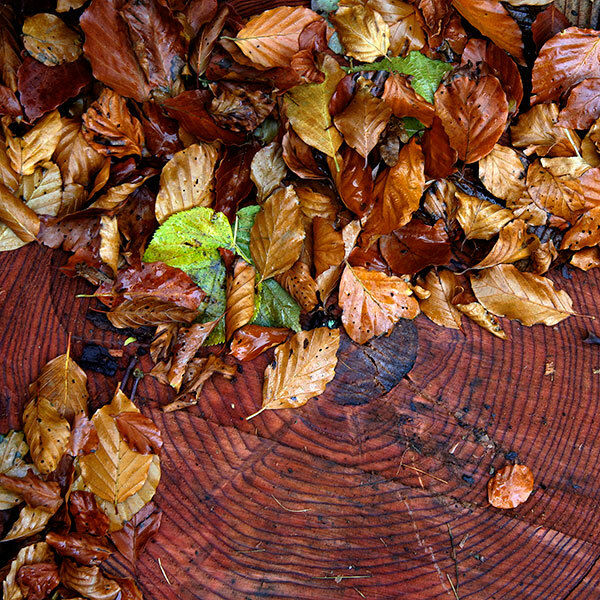 Recently cut through at ground level, the natural tone of the conifer wood is enhanced by rain and the camera's predilection for reds. A more casual glance at the grey background in a different context would suggest grey stone rather than decaying wood. 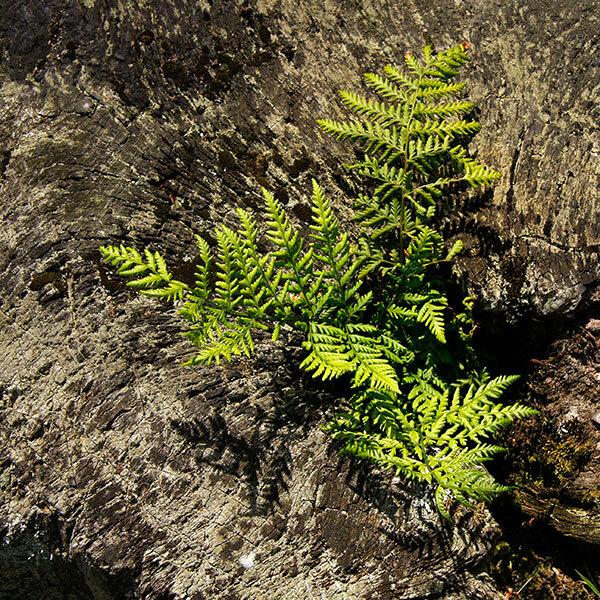 I liked the way it enhanced the bright spring green of this fern settling into a promising home. 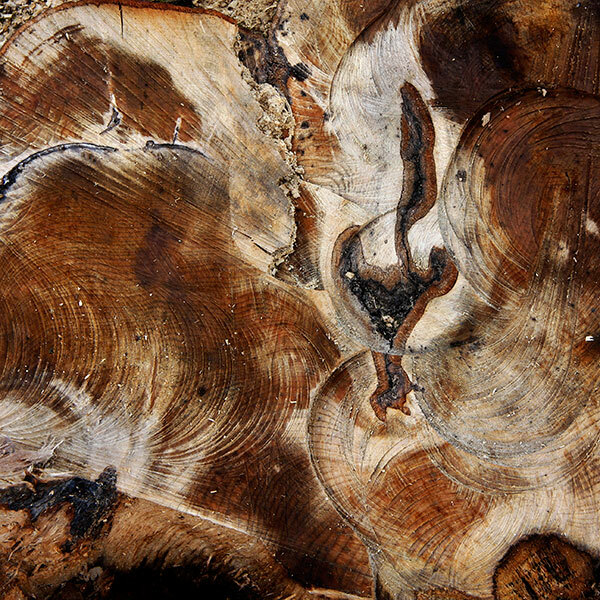 The fan-form lines in the wood echo those in the previous image but the colour range is completely different. 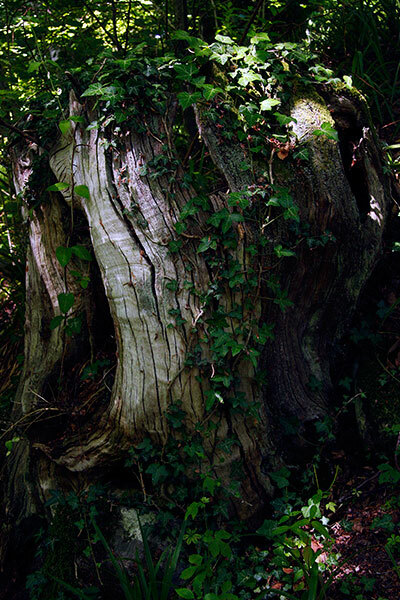 I walked past this hedgerow tree stump for years with the occasional vague thought that one day I might carry a camera to record it. By the time I took this shot it was amongst the flanked by sections of a tough hawthorn hedge and fronted by the spring stinging nettles, goose grass and other roadside plants. Using a tripod and long arms I managed the task from the tarmac without treading on any of them. A tripod would have been useful here rather than chancing that one of a number of hand-held camera shots from a woodland path would be sufficiently sharp: it's acceptable. 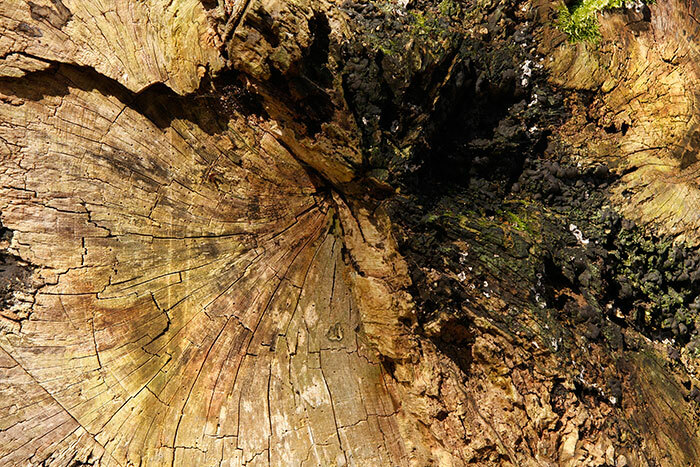 The decaying top of this tree stump is home to a vigorous woodland perennial. 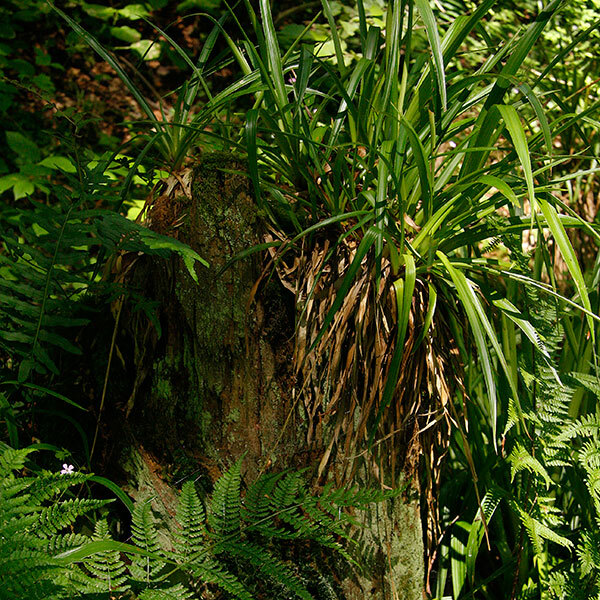 Ferns and ground cover plants shelter its lichen-splashed flanks.